Xijiang, Miao transliteration, meaning a place where the Miao Xi family was inhabited, is situated in 37 kilometers northeast of the county town. There are 12 natural villages, 1,200 families and 6,000 people, becoming the biggest Miao village in China, famous as the "one-thousand-Household Miao village" and a historical cultural ancient town. The village enjoys a beautiful natural environment with green mountains and crystal water. A spectacular view of Xijiang lit up in the evening. The village is located by the valley and surrounded by overlapping mountains, with terraced fields rising along the slopes to the clouds and the Baishui (White Water) River flowing through and cutting the village into two. Miao hillside pile-dwellings stand tier upon tier along the two banks to the mountain. Thick bamboo groves are dotting before and behind the houses. Beautiful maple leaves cover the villages on the top and at the bottom of the mountain. 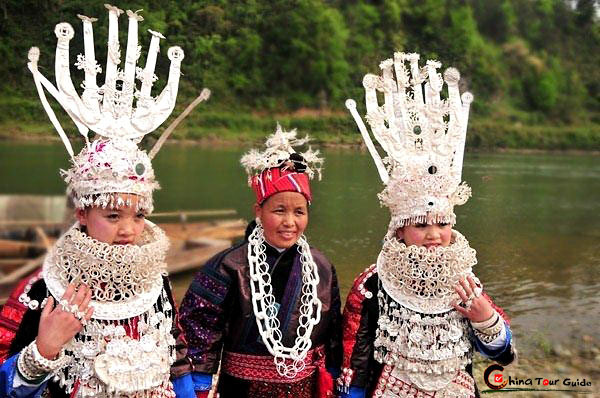 Have a photo with charming Miao girls in exotic costumes and brilliant silver ornaments. Miao girls are ready to present their colorful traditions to visitors. Xijiang Miao people have a long history, which dates back to the Chiyou Tribe. It is said that Chiyou's third son's descendants had formed the Miao cultural system before moving to Xijiang, and lived in a self-management for quite a long period, therefore, the Miao culture can be well preserved and developed, becoming a place where the Miao culture of "primitive state" is comparatively completely conserved, thus called " a national open-air museum". Xijiang Miao people are brave and hard-working, good at singing and dancing. The village is called "a sea of songs and dances", and the villagers sing songs to express their feelings and perform dances to celebrate their bumper harvests and to greet good luck. High-pitched beautiful flying songs, tactful and touching love songs or wine songs, Gabaifu songs, farewell songs sung at home all have their own tunes with emotion and scene mixed together. Xijiang Miao festivals are rich and colorful, such as the Tasting-Ripening-Grain Festival, the Miaoniao festival, the Guzang Festival, etc. Once you come to Xijiang, you will enjoy the Miao songs, dances, customs, rites, costumes and silver ornaments. Miao's folk residence--stilt house (Diaojiao House), built on the stilts of different heights. 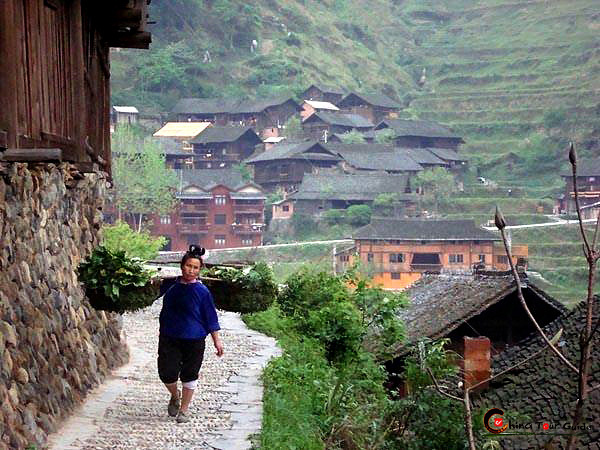 Peaceful and primitive lifestyle in Xijiang. Shoulder pole is still used by the local villagers today. A miao woman carrying her baby and vegetables on her way to home.